Tommy Bahama is a company that developed a lot over the years. What began as a clothing brand has since branched out to include accessories, sportswear, footwear, and home furnishing collections. And luggage of course, which is the topic of this review. The luggage produced by the company is aiming to provide quality at reasonable prices. It very much succeeds in doing so, one of the reasons why the most Tommy Bahama luggage reviews you will find online are positive. The company has different offers which will fit most travelers needs. From individual bags to sets, Tommy Bahama has it all. While there are a lot of offers from Tommy Bahama out there, we have reviewed five luggage items that we think are the best. The worst nightmare for a traveler can be when their bag refuses to accommodate all the items that need to be packed. The Mojito four-piece bags ensure that this situation never arises by including different sizes and by making each bag expandable. The set includes three spinners and a duffle bag. Each spinner suitcase is equipped with a four-wheel spinner system. This allows for ease of the maneuverability of the product. Regardless of whether you fill your Mojito bag to the brim, with the help of the quality wheel system, you will be easily able to take it along with you for long distances without much of an effort. 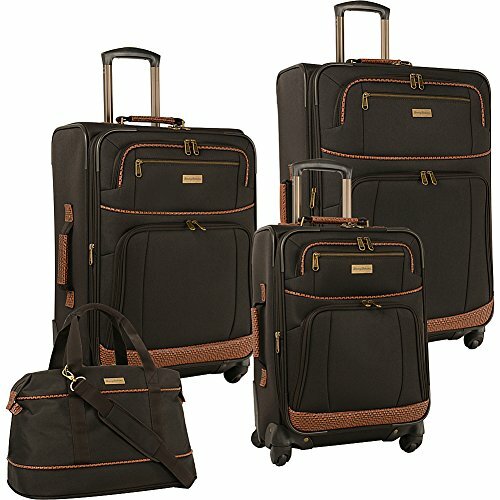 Moreover, Tommy Bahama understands customers’ need for a spacious yet compact suitcase. Hence, all the suitcases are expandable in nature. This feature allows the bag to have more packing capacity than some of the other suitcases of the same size. Meanwhile, if you don’t have enough luggage, the fact that this feature is optional means that you won’t be forced to carry a bag that is bigger than you need. The sizes of the suitcases are 28 inches, 24 inches, and 20 inches. Each suitcase is equipped with telescopic trolley handles which are comfortable to hold. The bags are equipped with exterior zipper compartments and interior pockets. The inner lining is the classic bamboo print which is a signature look of Tommy Bahama. The duffle bag comes with an open compartment for easy packing. A five-year warranty accompanies the product. The set is available in navy and dark brown. We were not a major fan of the premium price of the product, but when it comes to quality, the Mojito has managed to impress us and many others. You can also check which are the top luggage sets in 2018. It is difficult to provide the perfect size of a suitcase to customers. Some are considered to be too big, while others are thought to be too small. The fact that this 28-inch bag manages to be of a size that is preferred by the masses has led us to include this in our Tommy Bahama luggage review. You wouldn’t want to invest in a product that gets damaged easily, especially if it is a bag. After all, the last thing you want to be worried about when on your vacation is your luggage. While there are many brands that claim to provide durable items, only a few are able to follow through on this promise. This Softside luggage has been successful in doing so by constructing its bag from quality fabric. The trolley handle comes with a push locking mechanism which gives customers the autonomy to decide which height they want the trolley handle to be. This proves to be a source of massive convenience as the feature lets you alter the height as per your needs. The locking system also stabilizes the handle and makes sure it does not collapse. The dimensions of the bag are 19 x 10.5 x 28 inches. The weight of the product is approximately 13.7 pounds which is light enough to allow for ease in transportability. The bag comes with an array of pockets, which are situated on the internal side of the product, to aid in the effective organization of the luggage. The bag can be expanded to accommodate additional luggage. 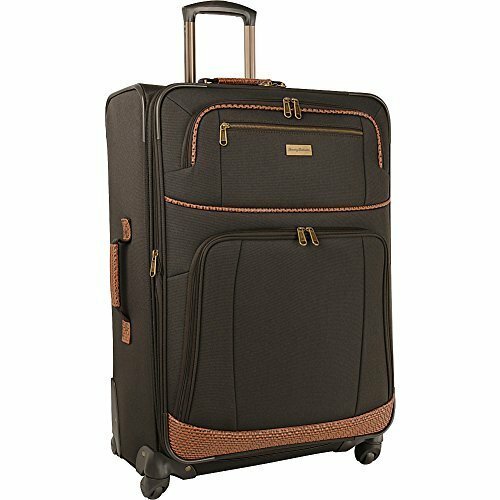 We found this product to be excellent when it comes to ease of rolling, quality and providing a spacious room for the luggage. We believe the bag can be made to be more stylish if the brand wishes to cater to those who look for aesthetics. We have included yet another item from the Mojito range of Tommy Bahama bags. Why? Well, it might have something to do with their ability to provide exemplary performance. One of the best things we liked about this product was the fact that it is equipped with a five-year warranty. This mere guarantee by the brand serves to be a proof of the quality and durability of the product. After all, no company would back up its weak products with such claims, will it? While some of you might consider the 24-inch size of the product to be too small, you might be surprised at the amount of luggage this seemingly compact bag can carry. This has been achieved by various factors, namely the expandable nature of the bag and the inclusion of additional pockets. This feature has made this the perfect bag for both light and heavy usage. Hence, whether you are going for a two-day trip or one that stretches over two weeks, rest assured that you will find the bag functional in all circumstances. The two-toned polyester fabric is used in the product. The trolley handles are telescopic in nature to provide a comfortable grip. The inner sides are lined with bamboo print. The bag is accompanied by four wheels. It is available in navy and dark brown color. It is 10 inches wide along with being 24 inches high. Sturdy, compact, and practical, this bag ticks all the boxes. We were unable to find any pressing flaws in the product. Among all other items mentioned in this Tommy Bahama luggage review, we found the Retreat Ii to be the most stylish of them all. This means that not only can you take all the required luggage on your trip, but you can also look good while doing so. The suitcase is available in two colors, namely chocolate, and brownstone. Both colors complement the signature brown trimming of the product very well. They also give the bags a luxurious yet simple look that neither looks too toned down nor does it seem too over the top. Hence, when it comes to aesthetics, Tommy Bahama has been able to achieve the intricate balance that many fail to do. Additionally, the quality of the bag is ensured by the inclusion of durable inner lining as well as a signature Tommy Bahama hardware. When you consider the quality of the handle along with the zipper, it is safe to conclude that the product can last quite long, thereby making the investment cost-effective. The material used in the construction of the bag is polyester. The item is 25 inches high and 18 inches wide. You can expand the bag if you have additional luggage. The valet straps included can be adjusted as per your liking. The exterior of the bag features two pockets. Stylish yet functional, this bag has been able to achieve the dream combination and is one of the best products to take with you on a trip. Overall, all five items mentioned in this list succeeded in satisfying customers in one way or another. While most Tommy Bahama luggage sets are of satisfactory quality, these five can be said to be the best of the best. Among them, we found Tommy Bahama Mojito Four-Piece Luggage Set to be the best. This is because it provided a different bag for different uses, making it a convenient purchase. The usability and functionality of the product are satisfactory as well. You are free to choose any of the Tommy Bahama luggage. Make sure you pick one that best suits your needs. For more luggage reviews visit our homepage. 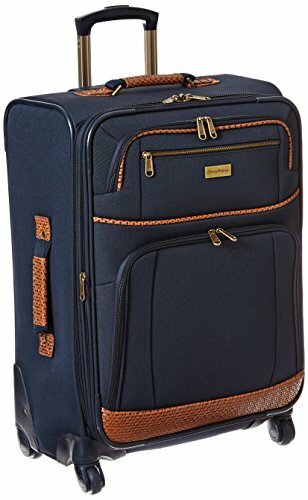 2019 LuggageLandia© Luggagelandia.com is a participant in the Amazon Services LLC Associates Program, an affiliate advertising program designed to provide a means for sites to earn advertising fees by advertising and linking to Amazon.com.